The Cairngorms National Park in the middle of the Scottish Highlands is twice the size of the English Lake District. It is almost the area of the North Yorkshire Moors and the Yorkshire Dales put together. That’s a very big area, as anyone who’s been lost on’t Yorkshire moors will strongly agree. Cairngorms is actually a misnomer. In the original Gaelic this range of mountains is known as Am Monadh Ruadh, which means ‘Red Hills’. Cairn Gorm is the name of one particular mountain in the range and means ‘blue cairns’ in Gaelic. The red hills have been erroneously painted blue. The chief outsider charged with this iniquity is an Englishman (had to be) named Colonel T Thornton, who visited Scotland on a sporting tour in 1786 and wrote a book about it, called, unsurprisingly, ‘A Sporting Tour’. In it he wickedly calls the mountain range any damn name he pleases (according to locals), or to be accurate (which he wasn’t) the ‘Cairngorms’. Dr Adam Watson knows so much about this mountain range that his nickname in academic circles is Dr Cairngorms. His study of the annual snow patches has shed much light on climate change. A snow patch is one that sticks around in gullies and sheltered places long after the rest of the season’s snow has melted. A couple of snow patches in the Cairngorms are famous for staying all year round. Dr Watson, who has taken extensive measurements from an early age, noted an increase in the instances of the melting of these patches between winters, three times since 1995. Previous to that date they had melted only twice since 1850. Not that he’s been taking measurements since then of course. He’s got a long white beard but he’s not Methuselah. Patricia MacDonald’s portrait of Dr Adam Watson in his beloved Cairngorms. Care of National Galleries Scotland. Although since 2007 this melting trend has been reversing, Dr Watson points to recent marine research which shows cooling effects of Pacific and Atlantic currents causing a hiatus in the warming process, which he stresses may only last a decade before warming takes off again. I don’t know what he’ll make of last winter’s snow in Egypt. Snow on the pyramids? We weren’t expecting that. The Cairngorm range contains 5 of the highest mountains in Scotland, but not Ben Nevis. That’s in the Grampians, as well you know. Its remote landscape has remained largely uninhabited, and much of it is inhospitable in winter months, but there are some ancient tracks that dare to cross it. One of these is Comyn’s Road, a medieval thoroughfare built for a horse and cart. It linked Kingussie, a small town in the Highlands, to Blair Atholl, an even smaller village in Perthshire. Back in the late 1200s, so the story goes, there was a particularly fine ale being brewed in Blair Atholl. The owner of a castle near Kingussie, Lord Badenoch, liked this ale so much he had the road constructed to transport it back to his home. This same Lord, also known in the history books as ‘Red’ Comyn, fought alongside William Wallace against Edward I, and then wrestled with Robert the Bruce for the crown of Scotland. Robert killed him in one-to-one combat. In the 16th century Comyn’s descendant built Minigaig road to replace Comyn’s road. It follows much the same route at first, then veers off to the right to follow the higher pass through the mountains before descending into Ruthven, near Kingussie. Throughout the 17th century this was the main trade route and everyone from cattle drovers to travellers used it, though winter conditions could be treacherous. Now this road is used only by keen walkers. Cars go sensibly round the outskirts on the A9. Minigaig road is 30 miles long, a two day trek across some of the most lonely and awe-inspiring scenery in Scotland. 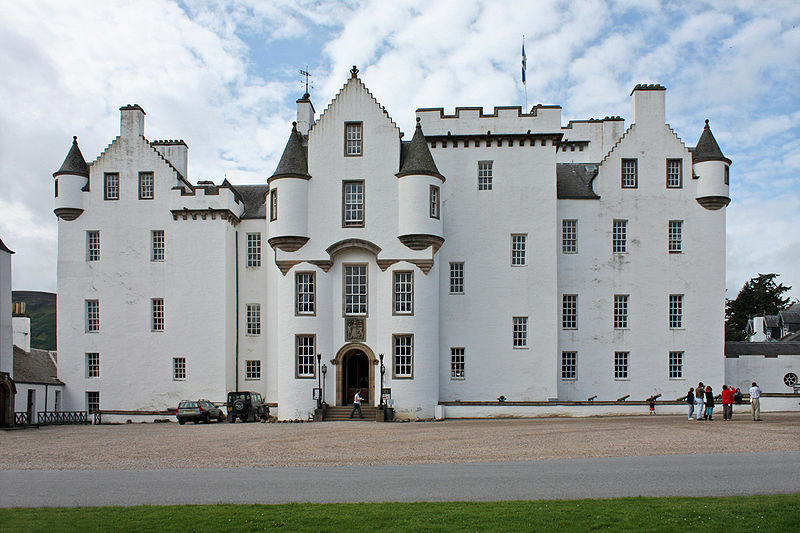 Most walkers start this trek at the spectacular Blair Castle. And finish up at Ruthven Barracks near Kingussie, built in 1719 just after the first Jacobite uprising. If you walk the Minigaig pass you may see the famous Ptarmigan, a Scottish grouse with mostly white plumage, which goes to bed in winter by flying straight into a snow drift and stopping up the hole with its feet. In the late afternoons, as your eyes adjust to the gathering dusk, you may imagine the ghosts of hardy 17th century traders, or even a 13th century horse pulling a cart loaded with beer barrels, its wheels shivering over the stones.